Cover Love at Romance Lives Forever is a short intro to a book and includes a cover, blurb, buy links, and social media contacts for the author. 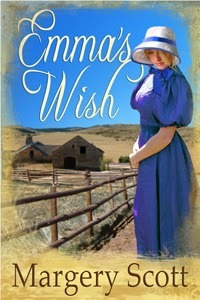 Today's featured book is Emma's Wish by Margery Scott. Still grieving his wife's death, Sam Jenkins needs a mother for his children. He can't build his ranch and care for three precocious youngsters alone. Emma Witherspoon has accepted the fact that she will never have a husband and children of her own, but that doesn't ease the ache in her heart. When Emma makes Sam an offer he can't refuse, neither of them can foresee the changes in their lives because of two little words - "I do."